The Melbourne Steam Traction Engine club was established over 50 years ago with the aim of preserving the last of the road steam vehicles. It quickly expanded its scope to include a wide range of vintage machinery. 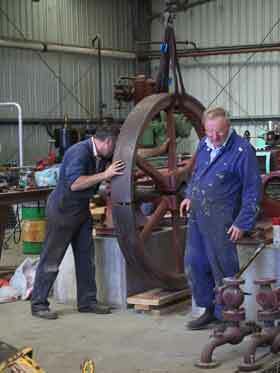 The club has about 160 members sharing a common interest in vintage machinery. Many of the items the club has preserved are too large to be collected by private individuals or require too many resources, financially or physically. With team work the club has been able to save them and present them to the public. Today the club’s museum features examples of the mechanical heritage that brought in our farm land, powered industry, generated our electricity, propelled our ships, worked our mines, ran our farms and built our roads. There is a great depth of knowledge and a wide variety of skills shared among the membership. There are no paid employees and the museum and all its projects are run using the talented volunteer labour of members. The club receives no government funding but is fortunate to lease the museum site from Parks Victoria for a peppercorn rental. Over the years the club has raised the funds to build the sheds that house the exhibits as well as the supporting infrastructure. The primary sources of funding are the annual Steamfest, income from the miniature railway , donations from visitors and supporters, occasional project grants and members contributions. The club has around 160 members. Members meet on the first Wednesday of each month at 8pm in the Club room at 1200 Ferntree Gully Rd., Scoresby. Visitors are welcome. This is a great place to meet experienced enthusiasts and share restoration tips. Groups of members meet at weekends to undertake a variety of activities including restoration tasks and exhibiting machinery. A group of retired enthusiasts meet on Thursdays. There are plenty of opportunities to become involved in worthwhile and interesting projects and to engage with a broad range of people with a common interest in machinery. Members can take up custodianship of an exhibit becoming responsible for its restoration maintainence and display. The club produces a monthly newsletter with articles of restoration interest. Membership subscription is $80 a year, with a pensioner rate of $65.